War may have broken the spirit, but it made the artist. 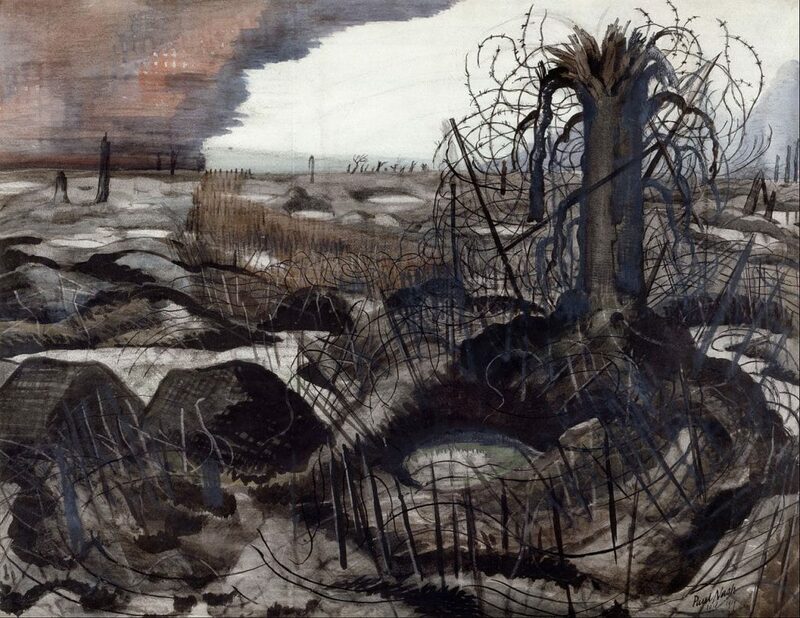 Paul Nash had always been a singularly talented painter with a mystical, neo-romantic vision of the natural world – but it was the horrific conflagration of war on an industrial scale that almost certainly shaped him to become one of the greatest British landscape painters of the 20th Century. The effect of World War One on his artistic maturity was profound, and his war paintings among his greatest masterpieces. Nash’s war started quietly enough. Two months after its outbreak he enlisted as a private in the Artists’ Rifles, a London regiment that oversaw ground duties at the Tower of London. It was a full two years before he received officer training to fight at the Front, by which time conscription for married men – he had married the Suffragette Margaret Odeh in December 1914, five months after the outbreak of the war – had been introduced. It was only near the end of 1917 that Nash became an official war artist. He had put in the request while recuperating in London, having fallen into a trench at Ypres in Belgium and broken a rib. The accident saved his life: just a few days later, most of the men in his regiment were killed at the Battle of Passchendaele. Despite his fluency and eloquence as a writer – his wartime letters to Margaret brilliantly express his despair and bitter anger at the destruction that surrounded him – it was a loss that he was never able to speak of directly. In some ways, the profound shock of it must have echoed the loss of his mother, who had died in a mental institution when Nash was 20. He may even have feared such a fate himself (just as, incidentally, that other great British landscape painter, JMW Turner had; like Nash, Turner’s mother had died in an asylum). He suffered from bouts of severe depression throughout his life, and his wartime experience would leave him, though no less productive, mentally and emotionally debilitated for years. These biographical details are not incidental to Nash’s creative development. 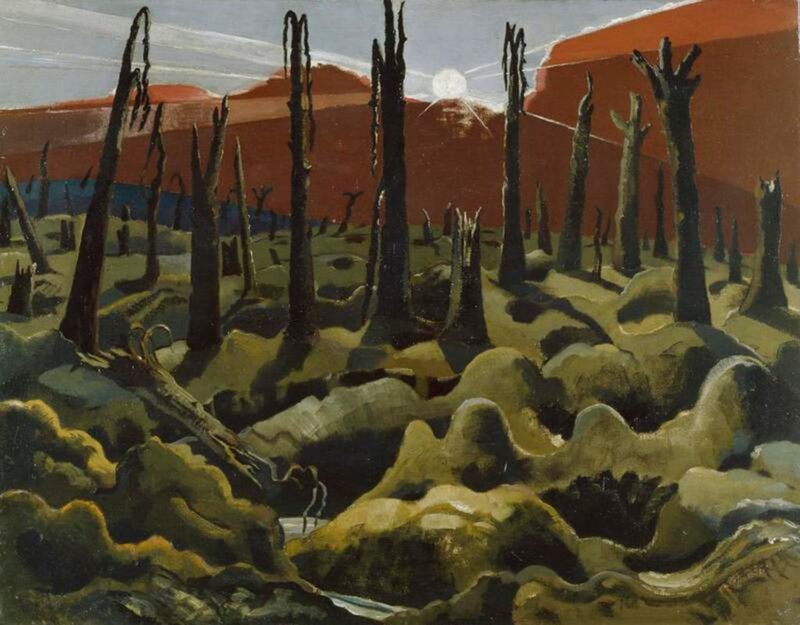 They provide an insight into the strange and haunted mood of his paintings, though they are somewhat hastily glossed over or left unmentioned in the otherwise superb Paul Nash retrospective currently at London’s Tate Modern. 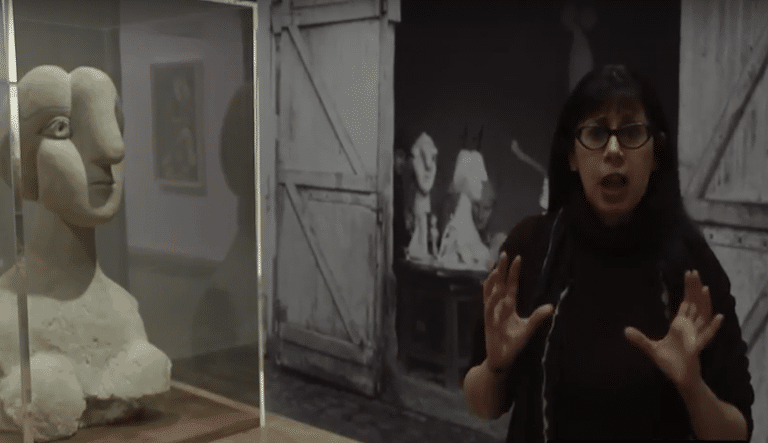 The survey features not only his most powerful war paintings, but devotes considerable space to the influence of the European avant-garde, particularly Surrealism, on his later output, in which that mood of disquiet becomes even more pronounced. Before the outbreak of WW1, Nash had produced detailed, neatly precise drawings of wooded vistas and airy garden idylls in ink, chalk and pencil. Dreamlike, they occasionally featured stiff, somnambulant figures and were sometimes, rather prettily, overlaid with watercolours. (It was only in 1918 that he began working with oil paints.) These early pictures were in the tradition of ‘visionary’ artists such as Samuel Palmer and William Blake, though direct inspiration also came from Pre-Raphaelite Dante Gabriel Rossetti, not so much for the latter’s Victorian medievalism but for his embodiment of the spiritual in art. From the start Nash’s own work was imbued with a spirit of place, the so-called genius loci. But it was a very different spirit that confronted him in Flanders in the winter of 1917 when, having recovered from his injury, he returned to the Front – a barren land of churned mud pockmarked with huge flooded shell craters that was barely passable. Death was all around, from shattered tree stumps to the twisted and mutilated bodies of soldiers. Not a dream, of course, but a waking nightmare. Nash was never particularly gifted at capturing the human form; soldiers, dead or alive, rarely inhabit Nash’s battered landscapes. In any case, the government censor would not have allowed for the depiction of dead soldiers – which, of course, would not have helped in the war effort. 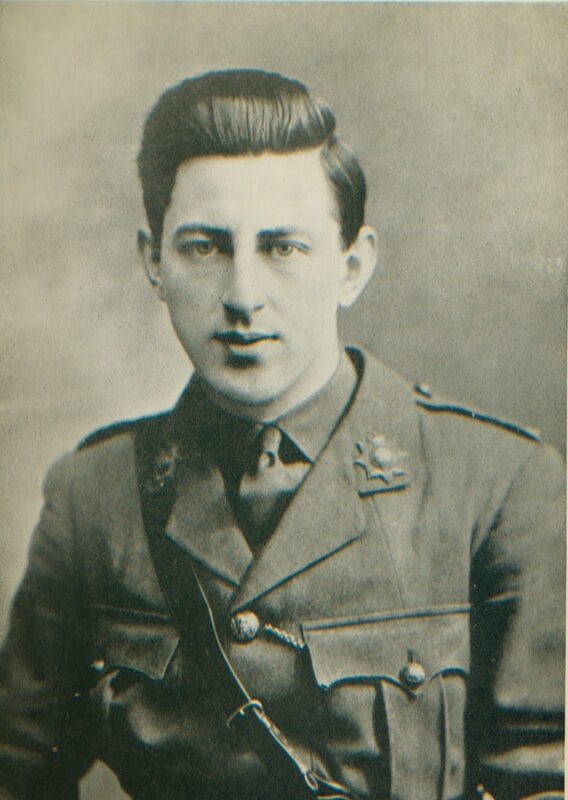 Unlike his fellow war artists, however, including his brother John Nash, Nash was most unusual in hardly depicting them at all, and never as the main focus of the image. Instead it’s nature that is disturbingly violated by the deadly weapons of war. It is always the aftermath of battle he depicts, not the tense moment just before an attack, nor the dramatic moment during it. We see how the depiction of the suffering of the Earth takes on an almost religious quality in Wire, a watercolour from 1918. The sheet of barbed wire encases the lone tree stump whose erupted form suggests a crown of thorns, while the other distant tree stumps resemble stakes ploughed into the barren ground. We see how, in an almost monochrome painting, the corner of a sky appears like an ominously spreading bruise in red and mauve. Anger comes through in the mocking title of one painting. We Are Making a New World (also from 1918) shows tree stumps, like a group of eerie sentinels, featured against a high horizon, over which a cold, chalk-white sun spreads its watery rays like thin search beams. Unable to warm the hard clumps of shattered earth, the sun is no longer a life-giving force. But Nash’s greatest WWI painting, and, at 6ft (1.8m) across, his most monumental, is the utterly arresting The Menin Road, 1919 (above). This time, unusually, we find the barely discernible figures of four soldiers attempting to move across the unforgiving, shell-shattered terrain. The painting’s dramatic diagonals and verticals show how Nash had adopted the hard intersecting planes of the English avant-garde Vorticist group. Commissioned by the Ministry of Information for a Hall of Remembrance that was never built, the painting was intended to celebrate the national ideals of heroism and sacrifice. This complex work is, perhaps deliberately, ambivalent on that front. But it does nonetheless express a kind of doomed magnificence. Due to his war experiences, Nash suffered a terrible and protracted breakdown. In 1921, he moved with his wife to Dymchurch on the Kent coast, where he painted some of his most unrelentingly stark paintings of the barren coastline. In one, Winter Sea, which he actually began in 1925 but didn’t finish until years later, the waves of the sea are shown as angular folds in grey, black and white. The close-up surface of the sea, the severe perspective and the pitch-black horizon all suggest that we might be looking at a precipitous pathway leading toward eternal darkness. Nash’s adult life was bookended by war. When the lights dimmed across Europe a second time, he was again commissioned to work as an official war artist, though this time Nash, whose health was increasingly fragile, remained in Britain. His most powerful painting of World War Two is Totes Meer, the title meaning ‘Dead Sea’ in German. 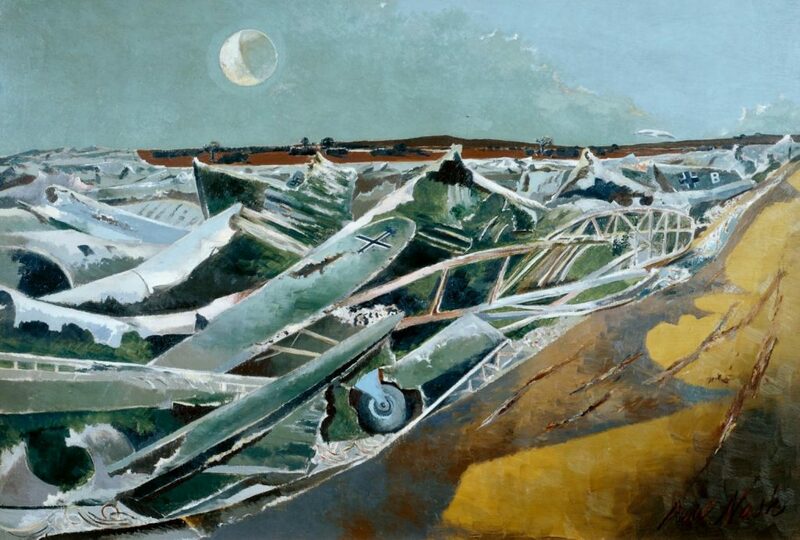 Instead of showing us a path towards eternal darkness, Nash painted a surreally undulating sea of crashed German bombers at Cowley, Oxfordshire, the site of a ‘graveyard’ for crashed enemy planes. Less than a year after the war’s end, Nash died in his sleep of heart failure, aged 57. Chronic asthma had made him increasingly sickly during the last 10 years of his life. But his last series of paintings, depicting a mysterious equinox of huge sunflowers – airborne precursors of death, the soul as a floating presence – are among his most colourfully seductive and lyrically beguiling.